State BJP leaders met Governor OP Kohli and staked claim to form government. The party secured a simple majority in the elections by winning 99 seats in the 182-member Assembly. Ahmedabad: The new BJP government in Gujarat, led by Vijay Rupani, will be sworn in on December 26, the party said on Saturday. "The governor accepted our claim and asked us to form government, after which we sought time on December 26 for the swearing-in ceremony," state BJP chief Jitu Vaghani told reporters in Gandhinagar. The ceremony will be held at the Sachivalya Grounds in Gandhinagar, Jitu Vaghani said. The party's state unit has invited Prime Minister Narendra Modi, BJP president Amit Shah, chief ministers of all BJP-ruled states as well as chief minsters of states ruled by NDA allies and all senior leaders of the party for the ceremony. Jitu Vaghani did not reveal how many ministers will take oath along with Chief Minister Rupani and Deputy Chief Minister Nitin Patel. 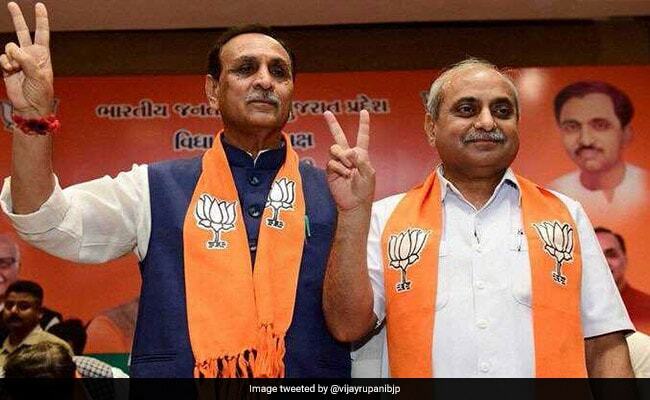 Vijay Rupani and Nitin Patel were elected as leader and deputy leader of the BJP legislative party on Friday in the presence of central observers finance minister Arun Jaitley and party general secretary Saroj Pandey.